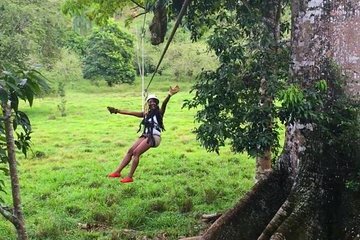 Ga ziplining en interactie met inheemse eekhoorn apen tijdens dit Eco-avontuur van 4,5 uur van Punta Cana. Pas op met veiligheidsuitrusting en zoom door de weelderige jungle van de Choco-regio over 7 kabelbanen en 2 hangbruggen. Met een naturalistische gids, ga het bos van Monkey Jungle, fruitmand in de hand, en interactie met vriendelijke eekhoorn apen. Vervoer van en naar het vliegveld van Puerto Plata is inbegrepen. This was a great trip but I wish I knew in advance that I would have to hike up a huge mountain to zip line and would have to climb up a lot of steps after the monkey jungle. This is not the excursion for someone who is not in good shape. The staff was great and the experience was a lot of fun. The other negative was that it was about a three hour drive from the hotel pickup to the attraction, we stopped at about five other hotels to pick up other guest. Staff is super friendly. The monkeys are the cutest! Zipline was over gorgeous landscape. We had a blast! This was a great day out! An early pick up by runners adventures from the hotel at 7.15am and back by 2pm. Water was provided and coke with a cheeky splash of local rum for the trip back!. Very well organised and the ziplines were great. The 3rd one of 7 is the fastest and best and the scenery is stunning. The guides led by Usher ! were very safety conscious but good fun. The monkey jungle was fantastic. Dara an Irish zoologist led us down past the peacocks and rabbits sprawled out on the steps and gave a history of the place and loads of information on the squirrel monkeys and capuchins. You get to feed the squirrel monkeys who are very cute and jump onto your shoulders and head to try and get some of the banana pieces and peanuts. Well worth the money and an added bonus is that the profits go to the medical unit providing free medical and dental care to the locals. I'll start with the one negative which is as compared to other zip line courses, this one was ok. there were plenty of them which was great but a couple were a little short. That being said, the guides were fantastic and the longer runs were great. Also, the opportunity to feed squirrel monkeys and check out some of the other wildlife in the sanctuary were not only unique but truly amazing. My kids and their friends could not say enough and haven't stopped talking about it. This is a great experience and allows you to support an awesome company that is providing other services to the island. Excellent time at the monkey jungle and zip lining tour. The guides were friendly and helpful. It was an awesome experience feeding the squirrel monkeys. The tour guides while zip-lining were hilarious and very energetic! Feeding the monkeys was such a wonderful and blissful experience. This tour was awesome! The staff was amazing and it was even more intriguing to sit with the founder and learn about the organization. Overall it was a great trip. Monkey Jungle staff were very impressive. For the amount paid for the excursion and the length of the trip, lunch should be included. The Money jungle was wonderful. The monkey's were so friendly and gentle. Zip lining was a blast. The guides were very professional and fun. I would highly recommend with trip.